This entry was posted on August 4, 2015 at 8:48 am and is filed under history & provenance. You can follow any responses to this entry through the RSS 2.0 feed. You can leave a response, or trackback from your own site. Richard: well… that’s perhaps not the most accurate post I’ve seen on the subject of the Voynich Manuscript’s quiration. 😐 . * As far as I can see, we currently have no evidence that any of the quire numbering was in any way original. What I further pointed out was that the quire numbers appeared to have been added by multiple people at different times (indeed different centuries): this was what I talked about in my Frascati presentation. * Bifolios were limited by the shape and size of the animal skin and by the location of any serious flaws. 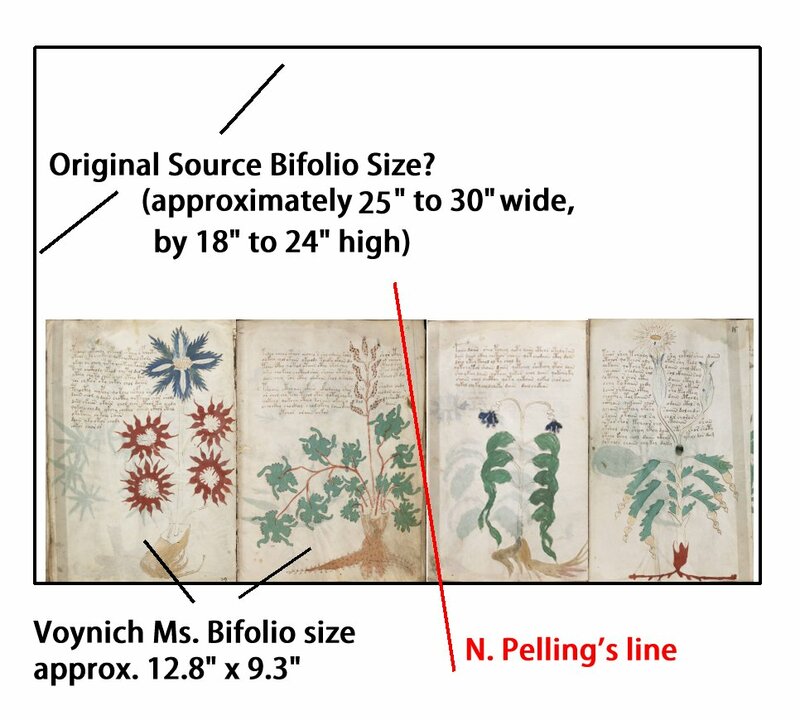 I tried to illustrate this on page 54 of “The Curse of the Voynich”: this suggests that the three bifolios might well have all came from a single skin, a prediction that could easily be tested (e.g. via DNA analysis). * The quire numbers were normally added as instructions to tell a binder in what order to bind the sequence of gatherings together. The manuscript was indeed bound, so having quire numbers surely ain’t no big thang. * Quire numbers are often found in both the middle and the side of the back page in different manuscripts. And it also ain’t no big thang to find them more towards the corner. Having said all that, I personally infer from the pair of bifolios you show here (with the same diagonal vellum flaw) that the two bifolios were cut out as a single 4-page-wide strip; then folded; then cut along that central fold; and then folded further (along their shared central fold); and placed into a gathering almost immediately. Again, this is a suggestion most of which could be tested by using a micrometer to measure the exact thickness of the vellum along both sides of the (hypothetical) central fold and seeing if they match up in the way I suggest. More generally, there are a hundred similar codicological suggestions I would like to test. Wouldn’t all our theorizing be better off if we could be definitively sure of how the artefact was made and constructed? As an aside, I suspect that the single large pieces of vellum of the dimensions you propose would have had to have come from an adult rather than from a calf. Perhaps this would be something you could try to do the calculations for? I’ve no problem with your thoughts that none of the quire numbers may be original. And if so, one would also have to wonder why this would have been done? Why add quire numbers to an existing, genuine, work, when this obviates their original purpose and function? I think the only conclusion then might be, “To deceive” in some way or the other… to add an air of authenticity, perhaps? And since some of these numbers are more obviously added (steel nib? ), then we already have this case. But then when we have such a thought in mind, we are on a slippery slope: If this, this and that was added, then perhaps the whole work was simply created, and these anomalies happen to be the only ones that are identifiable to us. The rest of the work was simply good enough to slip by. That is IMHO, in any case. I fully agree that your thoughts on this are a very strong possibility. In fact, this blog post is inclusive of your idea, not exclusive… for if the pages were cut from preexisting, full size folios, of course any included bifolios would be from the same skins, as you suggest possible. Thanks for that, I had not seen any so far, or not noted them. I was also going by the quote in Introduction to Manuscript Studies, which seemed to imply they are only in the center. When I find off-center examples, I’ll amend the post. I agree wholeheartedly. You’ve made great observations, and your theories relating to them are certainly plausible. But yes those theories… and mine, and those of others… only lead to more questions which could be tested. Perhaps some of these tests would then determine which, if any, of the theories is correct. I think, for instance, that Dana Scott’s “white edge” observation could lead to a reconstruction of the entire work. Edge thickness, too. And who is to say that the edges were cut perfectly straight, in any case… there may be errors to the edges that could be matched. And the Holy Grail: DNA. I don’t propose any sizes larger than the ones you suppose that original, smaller bifolios, may have been cut from (if from the same skins), so I’m not certain what you mean here. Whether cut into different bifolios from the start, as you propose, or cut into larger bifolios at first, and only separated into the smaller (Voynich sized) ones after an initial binding sometime later, the skin size would not change. The problem with your extra-large-bifolios-that-get cut down suggestion is that those extra-large bifolios have to be cut (inefficiently) from a large skin in order to fit. Bear in mind, with that particular skin I suggested, that it seems clear where the animal’s spine was, which means we can make a pretty good prediction about how the pages were cut from it. Well you can, too, and I welcome your input and contrary viewpoint. In a sense I want it to be your blog, too. Nothing I say has any value in a vacuum, so I appreciate your points and arguments very much. Are you here suggesting they are original quire numbers? If so, then I go back to the point in my blog, surmising (only) that they may be from larger bifolios, for the reasons given. But if you are not suggesting that, and only that they are from the 15th century… but added after binding… then for what purpose would someone have added them to an existing, bound, 15th century work? Or maybe I misunderstand you, here. I would point out, though, that anyone can add notations of any kind, from any era, to any work… and that if someone were adding quire numbers “for effect”, they may have just as well chosen what we see here: That is, 15th century quire numbers do not mean they were penned in the 15th century. It is the modern anachronistic content which interests me most for that reason. But in this case, we have several possibles: 1) the 15th century quire numbers were original, and served the usual purpose when binding the Voynich; or 2), they are 15th century, but added after binding, and so did not serve the usual purpose of quire numbers, or 3), they were added any time after the 15th century, and only written in the style of the 15th century. Now don’t get me wrong, I don’t ascribe or support any particular case, because of course I don’t know. I only point out that there are different implications to all three cases: #1 might suggest either that some quires of the Voynich were properly numbered, and others were not, in which case “why?” were the other quire numbers added? I can only think, since they served no original quire purpose, it was to deceive one into thinking they were real, “for effect”. In #2, that they were added, after binding, in the 15th century, we then have to ask the question again, “why?” would someone do this? I think this is your case, but I’m not sure… but I ask your opinion, “Why do you think someone in the 15th century would add quire numbers after binding a work?”. And #3, which is fine with me, too… as all cases are, of course, because I think the whole work is a fraud, added or original quire numbers not affecting that opinion. First of all, the bifolios I suggest are not “extra large”, but normal, full-size bifolios, and they were quite commonly used (link in my blog to one case, but of course there are thousands of such works). It is in fact the Voynich which is the smaller type. I understand this, and it is a major point to this blog post’s theory. As shown in my illustration, the alignment which you use to show the same skin may have been used, ALSO shows the same, larger, bifolios may have been used. So I absolutely agree with your observation… I only show a subset to the implication: Yes, same skin as you say; but possibly, cut as a larger bifolio first, aligning the marks just as you show in your book. I’m getting the feeling that was not clear, so I try to explain better… but that is the point, and it does not counter your useful observation at all. Well, yes, skins were of course cut to be most efficient. But the larger skins still fit in the same skins, aligned as you show (that is, I’m unclear as to why you claim larger skins would be needed in my case). And yes, large skins must have been stored for some time, even if only days or weeks, before being cut. But if this theory is correct, there is another implication: If the pages of the Voynich were cut from some pre-existing, blank, larger, three or four quires… that had been found lying around somewhere, already bound, it would tell us something about the creation of it, it would have a different set of implications than if it were only cut from the same skins. That is the crux of my argument: And as you say, further testing could, would, and should be done to determine which case is most likely. But from the feedback I have recently surmised from the winds that blow about the internet, I am not so hopeful that any further testing… nor previous results so far unreleased… will be available any time soon. So your theories, and mine, may remain just that, and untested, and indeterminable. Quire numbers were added to (unbound) gatherings primarily as instructions to the binders as to what to stitch together (into quires), and also as to the order the quires should be bound together. That was the whole point of quire numbers: that they were added before binding in order that the binders could do their job. In the case of the Voynich Manuscript, the – painfully close to indisputable – fact is that we have the majority of the quire numbers added in an obscure 15th century numbering style that only seems to appear in monastic manuscripts not too far from Lake Constance, and with letter forms and abbreviation forms that place it in the mid-fifteenth century. All three aspects were independently outdated by 1500, so it would seem extremely likely that these quire numbers were added long before 1500: hence the dating. So, the starting point we have is that in the mid-fifteenth century, the unbound Voynich manuscript was in the possession of a (probably Swiss or Tyrolean) monastery, where the quire numbers were added to its gatherings to be given to the monastery’s binder to stitch and then bind them together. By that specific logic, the Voynich Manuscript was made no later than the mid-fifteenth century: and given that its radiocarbon dating – even with my very minor suggested correction forward a decade or so – was from not long before, we have a fairly narrow window between its vellum’s production and its quires being numbered. But you do, in fact, believe certain of the quire numbers are original, and from the 15th century, as I gathered from “The Curse…”, and as you explain in your last comment. And I do like both your observation, and your opinions on it, and consider it very plausible. And those possibly original quire numbers are what I am referring to in this blog post (“[Nick] feels that some seem to be original, but some may have been added later, in different hands, and in an odd mix of styles.”). As so often happens, most of our discussions are an attempt to understand each others (often contrary, but not always) positions, but when we are patient, we usually get there. Rich: apologies, I probably wasn’t using “original” in an entirely clear sense there. Codicologically, the first few quire numbers form a separate 15th century ‘layer’ added on top of the original 15th century document. Higher quire numbers look to have been added in a number of different hands, and very possibly in different centuries. Curse p.17 has a diagram that attempts to group them – wouldn’t it be nice to have a spectroscopic comparison of all the quire numbers? So the Voynich Manuscript has both unusually small pages and almost unheard of fold-out pages? Wouldn’t that make it suspect in the eyes of the experts of the time and wouldn’t Voynich have been aware of that? Tigerofdarkness: actually, it has perfectly OK-sized pages. The fold-outs are unusual, but as far as I know nobody has yet made a concerted effort to look for similar fold-out pages in 14th or 15th century manuscripts. Hi John: This is one of the many ways that the idea of a modern forgery is dismissed: That something is so wrong, a forger… say, Voynich… would have known better, and therefore avoided it. It is ironically also said that some things are “so good” that a forger would not have made it that good, because it would have been suspicious, and a forger would have avoided it. There are even characteristics, and items, which have elicited both opinions, sometimes from the same person, in the same argument: That some thing is both too correct and too wrong to be a forgery. The armadillo is one example, various optical comparisons are another. But what one needs to do is wear Voynich’s 1908/09 shoes. What would he have reasonably known? What would a well-traveled, self-taught, revolutionary ex-Patriot Polish bookseller in London and Florence have reasonably known about the proper methods of book construction, literature, art and art history, inks, calligraphy, and so on. And when all the wonderful, perfect things about the manuscript, and all the ridiculously poor things about the manuscript, are seen in the light of this man’s probably mindset and world view, I’ve found that they make a very plausible, reasonable fit. In fact, some of these are traceable: That is, things that were not general knowledge in his time, or anywhere near as well as today, such as C14 testing, both the limits and range of Bacon’s experiments, various aspects of the Court of Rudolf II, the history of optics, and so much more. We can often reasonably know what he knew, by reading material and seeing collections that Voynich himself may have used as source material for his knowledge. 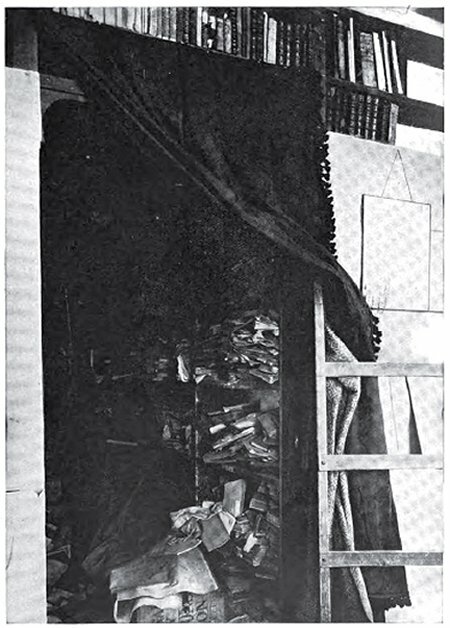 What we cannot do is use our present knowledge to grade his judgement as a possible forger… nor even, for that matter, a 1921 and later mindset, for by that time scholarship was already dismissing many of his own claims for the work, and fast launching the reputation of the work into its present state of limbo. So he may have missed things, and made some missteps: such as… as you say… the fold outs. He may have missed the use of quire numbers, and our ability to see a line made by a steel nib pen. He may have used the same ink for the last page marginalia, as the main text, never expecting testing to think them “too close”. He might have missed that some numbers and characters came later than his target range(s), and that the green microscope was too new to use, and that Roger Bacon would eventually be judged much less proficient in optics. And he might have used a cover he thought appropriate, never realizing it would be judged much too new to be original. And he may have chosen vellum which would be tested, long after his death, to a date which did not match any era he intended for the work. But reasonably, in his time, they did work for a time. Don’t forget, Voynich “got away” with this as a Roger Bacon Cipher Manuscript for a good 9 years! From 1912 to 1921, or thereabouts, it was all the rage as a wonderful, history making discovery. In fact, it is its very own success which in part caused a re-evaluation of Bacon’s work and life, which then focused more scholarly scrutiny on the work itself, and so dismissed it as a Bacon. But then, there are those who still do think it could be a Bacon… or a copy of one, that is. And if a forgery, it is still working, in fact, because most still think it real. So to me it is ironic to thinking that something, such as the page foldouts, should have been realized by Voynich to be “too new” to be used, that he would have done a “better job”. If this and other evidence is dismissed, then using such improper content, methods, materials does not matter, and therefore he can still be said to have done a wonderful job at forging this. Rich: almost all of the things you cite here as being supportive of position X / Y / Z are simply uncertain. 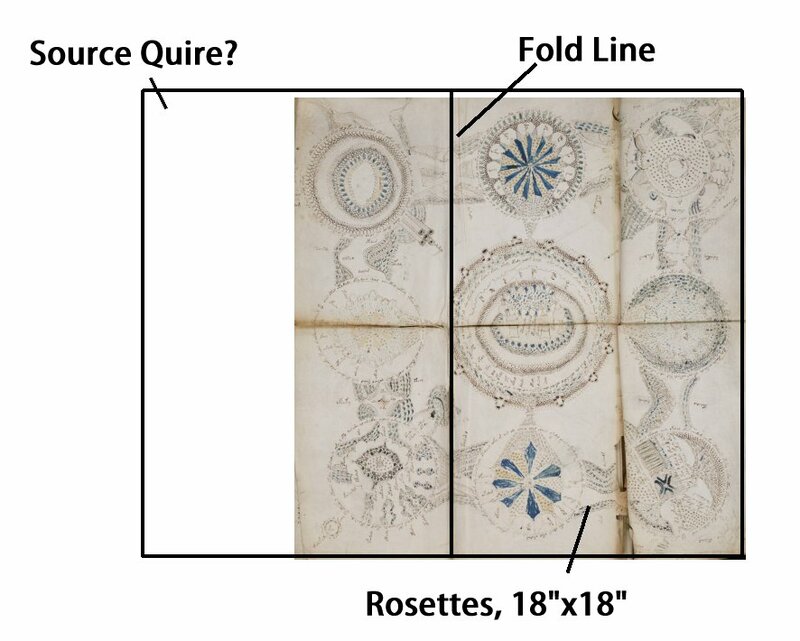 As I noted, we don’t yet know enough about foldout pages in 14th and 15th century mss to say what their presence here suggests or implies: and the same goes for the supposed ‘armadillo’ (which must already have at least ten different competing theories). But the basic codicological analysis – that it has fifteenth century written all over it, quite literally – still stands: and there is no uncertainty about that.